This is a warm growing species from Central America found from Nicaragua to Panama and the nearby regions of Colombia. 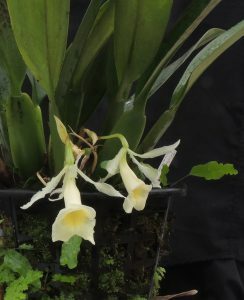 The short lived but very attractive and fragrant flowers are produced from the base of newly matured bulbs and in common with most Trichopilia the lip is very large compared to the other petals and sepals. When flowering well we have had more than ten flowers out at once which gives a great show. We find the species challenging to grow without black spotting on the leaves and for us the spotting seems to result from heat stress caused to the leaves either by too much direct sun or by the plant drying our on hot days. As a result we aim to grow the plant shaded and damp at all times and this results in the glossy dark green bulbs and leaves seen here.